A method using direct immersion solid phase microextraction (DI-SPME) coupled to gas chromatography equipped with a flame ionisation detector (GC-FID) was developed for the analysis of 7 chlorinated benzenes in dam water. The main parameters affecting the DI-SPME process were optimised. The optimised method comprises the use of a 100 µιη polydi-methylsiloxane (PDMS) fibre coating; 5 ml sample size; 700 r/min rate of agitation and an extraction time of 30 min. The calibration curve was linear with correlation coefficients ranging from 0.9957-0.9995 for a concentration range of 1-100 ng/ml. 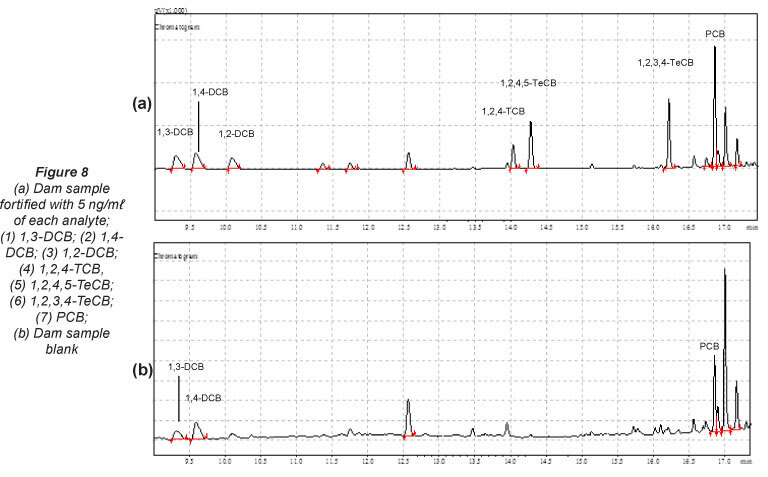 The limits of detection and quantification ranged from 0.020-0.265 ng/ml and 0.204-2.65 ng/ml, respectively. Recoveries ranged from 83.6-107.2% with relative standard deviation of less than 9.2%, indicating that the method has good precision. The method is reliable and is free of matrix interferences. Water samples collected from Grootdraai Dam were analysed using the optimised conditions to assess the potential of the method for trace level screening and quantification of chlorobenzenes. The method proved to be efficient, as 1,3 dichlorobenzene, 1,4-dichlorobenzene and pentachlorobenzene were detected at concentrations of 0.429 ng/ml, 1.685 ng/ml and 1.433 ng/ml, respectively. Among persistent organic pollutants (POPs), chlorobenzenes are some of the most frequently encountered compounds in aqueous systems. These compounds can enter the environment via natural and anthropogenic sources, and are ubiquitous due to their extensive use over the past several decades (Soonthorntantikul et al., 2009). Several chlorobenzene compounds, once in the environment, can be biologically accumulated, and are reputed to be carcinogens and extremely hazardous to health. Chlorobenzene compounds are listed as priority pollutants by the United States Environmental Protection Agency (USEPA) (He et al., 2000). Excessive exposure to these compounds affects the central nervous system, irritates skin and upper respiratory tract, hardens skin and leads to hae-matological disorders including anaemia (Kozani et al., 2007; Khajeh et al., 2006). In spite of these harmful effects, chlorobenzenes are still used widely as process solvents and raw materials in the manufacture of pesticides, chlorinated phenols, lubricants, disinfectants, pigments and dyes (Grosjean, 1991; Vidal et al., 2007). In the light of the above, it is imperative to continuously monitor the levels of chlorinated benzenes in all types of surface waters, using a low-cost but sensitive method. Analysis of chlorobenzenes at trace and ultra-trace levels requires pre-concentration as well as sample matrix clean-up to remove any interfering components (Chisvert et al., 2009). Various pre-concentration techniques have been used for the isolation of chlorobenzenes from water. These include traditional liquid-liquid extraction (Ormad et al., 1996); solid phase extraction (Wang and Lee, 1998; Liu et al., 2004); single drop microextraction (Tor, 2006; Khajeh et al., 2006; Vidal et al., 2005); stir bar sorptive extraction (Montero et al., 2004) and solid phase micro-extraction (SPME) (He et al., 2000; Wang et al., 2003; Huang et al., 2007). These pre-concentration steps precede analysis using gas chromatography coupled to an appropriate detector for identification. Whereas mass spectros-copy (MS) and electron capture detectors (ECD) are excellent detectors for the analysis of these compounds, due to superior sensitivity, accuracy and resolution, they incur relatively high capital, operational and maintenance costs which results in decreased throughput. Although relatively low detection limits can be attained with MS and ECD as detectors, the actual limits set by environmental protection agencies are much higher and can be attained with less expensive systems. This report describes a system comprising a pre-concentration device, a standard chromatograph and a flame ionisation detector (FID). Pre-concentration was effected through direct immersion solid phase micro-extraction (DI-SPME). Experimental parameters affecting the extraction efficiency of the selected chlorobenzenes, such as fibre type, sample size, rate of agitation, salting-out effect and extraction time, were optimised and applied to the Grootdraai Dam water samples for the quantification of chlorobenzenes. The chlorobenzenes selected for this study were: 1,2-dichloro-benzene (1,2-DCB); 1,3-dichlorobenzene (1,3-DCB); 1,4-dichlorobenzene (1,4-DCB); 1,2,4-trichlorobenzene (1,2,4-TCB); 1,2,3,4-tetrachlorobenzene (1,2,3,4-TeCB); 1,2,4,5-tetra-chlorobenzene (1,2,4,5-TeCB) and pentachlorobenzene (PCB). These standards were high purity (> 98%) and were purchased together with HPLC grade methanol (99.9%) from Sigma Aldrich (Milwaukee, WI, USA). 'ACS reagent' grade sodium chloride (> 99%) was purchased from Merck Darmstadt, Germany. 100 µπι polydimethylsiloxane (PDMS) and 85 µιη polyacrylate (PA) SPME fibres were purchased from Supelco (Bellefonte, PA, USA). 1 000 mg stock solutions of individual standards were prepared. A 1 000/t mg/t multi-compound solution was prepared, from which a 100 µg/t working standard was prepared daily by a series of dilutions. All solutions were prepared in methanol and stored under refrigeration at 4ºC. Purified water (18 MD-cm resistivity) for this study was taken from a Milli-Q water purification system (Millipore, Bedford, MA, USA). Grab samples were taken from the Grootdraai Dam in 1 t Schott bottles, which were subsequently stored under refrigeration at 4ºC. The samples were taken at the dam wall and from a depth of approximately 0.5 m. No samples were taken from the point of discharge. The Grootdraai water samples were filtered through a 0.45 µΓη membrane filter, prior to analysis, to eliminate particulate matter. The Grootdraai Dam is an impoundment on the Vaal River which is situated northeast of Standerton in the province of Mpumalanga, South Africa (locality: 26°54'33.6"S 29°23'42.5"E) (Van Ginkel, 2001). 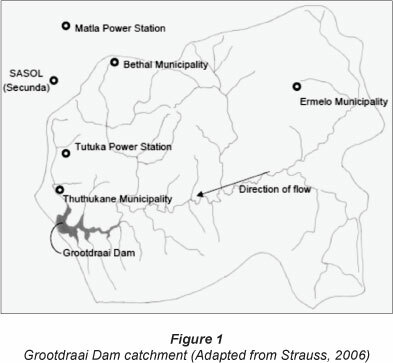 The dam, built in 1981, has a gross storage capacity of 364 million m3, surface area of 39 km2 and an average depth of 27 m. The Grootdraai Dam is upstream of the Vaal Dam, forming part of the Usuthu-Vaal Scheme (Strauss, 2006; Jeleni and Mare, 2007). With the exception of a small local community, there is limited domestic use of water directly from the dam. The Grootdraai Dam catchment has a surface area of 7 928 km2 and the major water users are industries and municipalities (Fig. 1) (Strauss, 2006; Van Ginkel, 2001). The optimisation of the main parameters influencing an SPME extraction was performed using Millipore water fortified with the seven chlorobenzene isomers. All SPME extractions were performed in 22 mt amber glass vials. For a typical experiment, an aliquot of 5 mt of Millipore water was fortified with a mass of 10 ng of each analyte. In the case of the experiments for salting-out effect, 5 mt sodium chloride solutions of 5%, 10%, 15% and 20% (m/v) instead of pure Millipore water were used. To enhance the transfer of analytes to the fibre, agitation was performed using a 2 cm Teflon stir bar, coupled to a magnetic stirrer. The vials were then sealed with screw-type plastic caps containing a PTFE/silicon septum. The SPME manual holder needle was used to penetrate the septum, and the fibre was then directly immersed into the sample solution for a pre-determined time. To enhance exposure of the fibre to the analytes, precaution was taken to ensure that the fibre was exposed to the outside flow of the vortex rather than directly within the vortex. After extraction, the fibre was retracted into the protective needle and removed from the sample vial. Lint free tissue paper was used to remove any water molecules present at the entrance of the protective needle. The protective needle was then used to penetrate the septum of the GC, and the fibre was then exposed to thermal conditions of the injector port for desorption. All samples were freshly prepared minutes before the extraction to reduce/eliminate any losses due to volatilisation or decomposition due to prolonged storage. SPME fibres were conditioned for 30 min every morning and blank fibre injections were performed to assess the presence of any contamination within the fibre. Analysis was performed with a Shimadzu (Tokyo, Japan) GC-2014 GC-FID system equipped with a SBPX-5 capillary column (30 m x 0.25 mm internal diameter, 0.25 µηι film thickness). Helium was used as the carrier gas which was passed through an oxygen, moisture and hydrocarbon trap prior to entering the GC. All GC injections were done in the splitless mode and the injector port was equipped with a glass insert for splitless injection. The vent valve of the split outlet was closed for 30 s and then opened fully. The GC conditions were as follows: injector port and FID temperatures were 250ºC and 300ºC, respectively; constant column flow rate was 1 ml/min; oven temperature programme was 60ºC held for 2 minutes, ramped at 10ºC/min to 70ºC and held for 4 min, ramped at 5ºC/min to 85ºC, ramped at 15ºC/min to 205ºC, ramped at 25ºC/min 280ºC and held for 5 min. The total analysis time was 26 min. All chromatographic data were processed using the GC solution post-run software (Shimadzu, version 2.30). Several analytical parameters can be optimised to enhance the extraction efficiency of chlorobenzenes from water using the DI-SPME method. These parameters included SPME fibre coating, sample size, rate of agitation, salting-out effect and extraction time. Fibres coated with polyacrylate (PA) and polydimethlylsilox-ane (PDMS) were tested for extraction efficiency. The results, depicted in Fig. 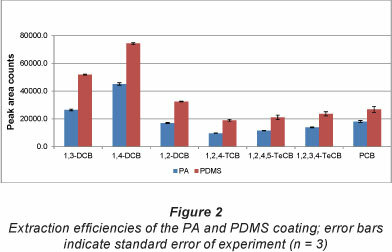 1, show that the PDMS-coated fibre gives better extraction for all seven analytes tested. This is also consistent with the fact that PDMS is more non-polar than PA and that the analytes have relatively low polarity. The PDMS fibre was used for the rest of the study. In DI-SPME studies performed on water matrices, such as those of Filho et al. (2010), Lopez-Darias et al. (2010a), Lopez-Darias et al. (2010b), Meng and Anderson, (2010), Li et al. (2009), Luan et al. (2007) and Junior and Re-Poppi (2007), a constant sample size was used while optimising all other parameters. 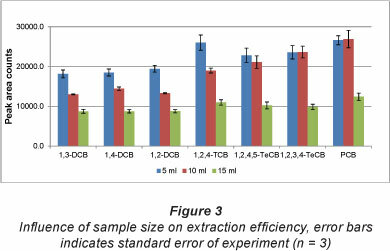 Since this study aimed to take advantage of any enhancement in extraction efficiency, 3 sample volumes (5 ml, 10 ml and 15 ml) were investigated. 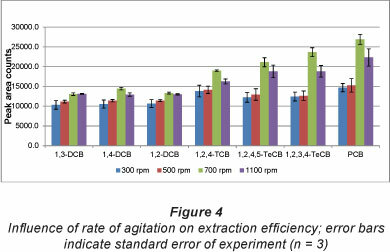 Figure 3 shows that superior extraction efficiency was obtained using a sample volume of 5 ml. Further increases in sample volume resulted in decreased extraction efficiency. The enhanced extraction efficiency at lower sample volume can be attributed to a larger phase ratio between volume of the fibre coating and sample. In light of the above, a sample size of 5 ml was used for the rest of the study. In view of the observation (Pawliszyn, 1997) that equilibration times are dependent on the rate at which the solution is stirred, 4 stir speeds were tested while other parameters were kept constant. The results are shown in Fig. 4. It is evident that a stir speed of 700 r/min resulted in the highest extraction efficiency; while further increase to 1 100 r/min resulted in a decrease in extraction efficiency. Kin (2008) experienced a similar phenomenon, which is due to the vibration of the stir bar and the irregular agitation of the sample at high stir speeds. Furthermore, a stir rate of 1 100 r/min resulted in splashing of sample onto the walls of the glass vial. This could have resulted in the loss of analytes and decreased extraction efficiency. In addition, higher random errors were obtained at higher stir rates, indicating that experiments at this stir speed were a lot more difficult to reproduce, thereby decreasing method precision. From Fig. 4, it is apparent that the rate of agitation had a minimum effect on the lower chlorinated benzenes (1,3-DCB, 1,2-DCB and 1,4-DCB, 1,2,4-TCB), while higher stir rates promoted an enhanced extraction efficiency for the higher chlorinated benzenes (1,2,4,5- and 1,2,3,4-TeCB and PCB). This suggests that the rate of mass transfer from the bulk of the sample to the fibre is sufficient for low molecular weight chlorobenzenes at low rates of agitation. The converse is true of high molecular weight chlorobenzenes; therefore a stir speed of 700 r/min was deemed optimum and was used for the rest of the study. Salt is added, in SPME, with the aim of effecting a modification to the sample matrix. An increase in ionic strength reduces the solubility of some analytes. A concomitant increase in extraction efficiency is expected on the basis that more of the analyte is available for adsorption onto the fibre (Kin, 2008). As such, sodium chloride was added to aqueous samples to attain concentrations (m/v) ranging from 0-20%. 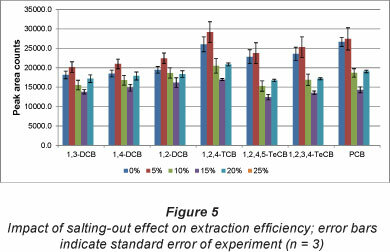 Figure 5 indicates that 5% (m/v) salt concentration had a slight improvement on the extraction efficiency while a further increase in salt concentration resulted in a drastic decrease in extraction efficiency. Ionic strength has a greater effect on analytes which have high water solubility (Santos et al., 1996). Therefore, it is evident that the compounds with higher water solubility (1,2-DCB, 1,3-DCB, 1,4-DCB and 1,2,4-TCB) were extracted to a greater extent (9-13%). By contrast, ionic strength had a minimal influence on compounds with lower water solubility (1,2,3,4-TeCB; 1,2,4,5-TeCB and PCB) resulting in a 2-6% enhancement in extraction efficiency. These observations are attributed to the effect of hydration spheres around the salt molecules. These hydration spheres reduce the amount of water molecules available to dissolve the analytes, which results in an increased mass transfer of certain analytes into the extraction phase (He et al., 2000; Psillakis, 2002). He et al. (2000) reported an increase in extraction efficiency with ionic strength, in the extraction of chlorobenzenes from river water using HS-SPME. These authors reported an optimum ionic strength of 20% (m/v). In contrast, the optimum ionic strength obtained in this study was 5% (m/v). This discrepancy can be explained in terms of the mode of extraction used. He et al. (2000) used the headspace technique and thus the SPME fibre was not exposed to the ionic species and other interferences in the sample matrix. Since this study used the direct immersion mode the fibre was directly exposed to the ionic species and interferences in the sample matrix. Initially, an increase in extraction efficiency will be experienced (salting-out effect) at lower salt concentrations. However, further increases in salt concentration will result in a decrease in extraction efficiency. This is due to an increase in the interactions between the analytes and the ionic species, which reduces the analyte's ability to move into the extracting phase. 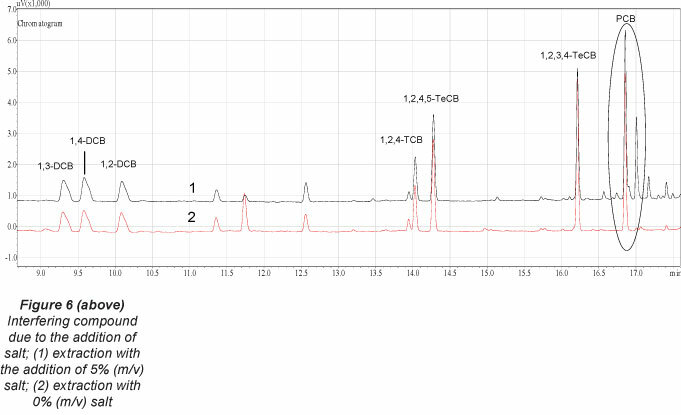 However, an addition of salt resulted in the introduction of several interferences in the sample matrix as can be seen in the chromatogram given as Fig. 6. Although there was no co-elution, these interferences would have resulted in a decrease in both the limits of detection and quantification. Since the salting-out effect had a slight effect on the extraction efficiency, it was decided to carry out further experiments without the addition of any salt. SPME is an equilibrium process; therefore it is imperative to determine the time required for each analyte to attain equilibrium with the fibre coating. While maintaining all other extraction parameters at optimum levels, the duration of extraction was varied from 5 min to 120 min. The results are depicted in Fig. 7. The equilibration time is defined as the time after which the amount of analyte extracted remains constant (Pawliszyn, 1997). Figure 7 indicates that the DCB isomers attained equilibrium rapidly. 1,2,4-TCB required 30 min to attain equilibrium while 1,2,3,4-TeCB, 1,2,4,5-TeCB and PCB required 60 min. The results indicate that equilibrium times are compound dependent, having a trend of increasing times with increasing degree of chlorination and molecular weight. The chlorobenzene compounds with higher vapour pressures and octanol-water partition coefficients and lower molecular mass attained equilibrium rapidly. To enhance throughput, a 30-min extraction was selected for the rest of this study. It should be noted that by terminating the extraction process prior to equilibration of PCB, 1,2,3,4- and 1,2,4,5-TeCB being attained, reduced method reproducibility can be anticipated. This occurs during 'pre-equi-librium' of analytes. Small changes in time result in large change in the amounts of analytes adsorbed (Vas and Vekey, 2004). A newly-developed analytical method needs to be validated to determine its suitability for the intended application. The figures of merit of the validation experiments are shown in Table 1. The linearity of the analytical method was determined within an analyte mass range of 1-100 ng/ml. The R2-values of the analytes ranged from 0.9957-0.9995 (Table 1). This indicates good linearity of the optimised method as there is a linear relationship between analyte mass and detector response within the range of trace concentration levels. Heet al. (200D) reported correlation coefficients of greater than 2.9910 for each analyte, at a linearity range of 0.2.20 ng/m. using HS-SPME coupled to GC-MS. This study produced slightly improved correlation coefficients, of greater than 0.9957, over a wider concentration range, indicating that there is a more accurate mathematical relationship between detector response and analyte concentration. As generally accepted, the LOD was taken to be the concentration of analyte which yielded a signal to noise ratio of 3, and the LOQ as the concentration of analyte which yielded a signal to noise ratio of 10. Table 1 shows the LOD and LOQ obtained for each analyte. Furthermore, the LOQs obtained in this study are well below the regulatory limits of the World Health Organisation (WHO) and USEPA drinking water guidelines. This indicates that the LOQs obtained in this study are well within the levels required for trace concentration analysis and are suitable far tharautice ana1ysÍD ofcfdorobenzeCes indrinking watef. Recovery experiments were performed to determine the efficiency of the method for the extraction of chlorobenzene from the Grootdraai Dam water samples, as well as to investigate the presence of any matrix interferences. The optimised method was initially applied to 5 mt of water collected from the Grootdraai Dam. The chromatogram in Fig. 8a indicates the presence of 1,3-DCB, 1,4-DCB and PCB. The optimised method was then applied to 5 mt of Grootdraai Dam water which was fortified with 10 ng/mt of each analyte (Fig. 8b). The average recoveries obtained in this study were within acceptable limits ranging between 83.6% and 107.32% with RSD values of less than 10%. This indicates that the optimised method is quantitative, free of any matrix interferences and has good repeatability. However, raw water samples, having interfering compounds such as humic and fulvic acids, may require additional clean-up procedures to improve the efficiency of the pre-concentration technique. The data from 5 reports published in journals have been tabulated in Table 3 to indicate the relative rank and value of the method reported herein compared with reputedly more sophisticated and sensitive methods. Although the LODs for the GC-FID method are much higher, relative to the studies listed Table 3 (Vidal et al., 2005; Vidal et al., 2007; Li et al., 2010; Bagheri and Aghakhani, 2011), it is worth noting that these LODs are adequate for monitoring samples to assess compliance with regulatory limits specified in international standards and guidelines (WHO in this case). In addition, the GC-FID is easy to use and is relatively inexpensive. However, upon comparison with a study using a similar detection system coupled to HS-SDME (Zhao et al., 2009), the LOD obtained in this study for 1,4-DCB, 1,2-DCB and 1,2,4-DCB is 1.9-4.6-fold lower. Additionally, the method presented in this study offers a higher degree of precision. This indicates that the DI-SPME method developed in this study is superior to the HS-SDME method of pre-concentration. Three chlorobenzene isomers were detected in the Grootdraai Dam. These included 1,3-DCB; 1,4-DCB and PCB, at concentrations of 0.429 ng/ml, 1.685 ng/ml and 1.433 ng/ml, respectively. 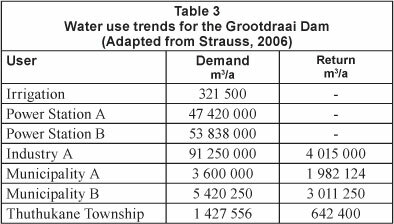 The major water users of the Grootdraai Dam are industries and municipalities (Table 2). The contamination by chlorobenzene isomers in the Grootdraai Dam could be due to agricultural chemical run-off, indiscriminate discharge of effluent from chemical industries, air emissions during chemical manufacturing, return flow from wastewater treatment plants or disposal of materials containing these compounds within the catchment of this impoundment. 1,3-DCB and 1,4-DCB are commonly used in the manufacture of pesticides, indicating that agricultural activities within the catchment which use these pesticides are a possible source (McPherson et al., 2002). Various environmental influences, particularly stormwater run-off, can mobilise the chloroben-zenes which will ultimately enter the waterways emptying into the Grootdraai Dam through surface runoff. The occurrence of PCB in the Grootdraai Dam is quite noteworthy, as there is currently no large-scale use and commercial production of the chemical. However, since PCB is produced in small quantities during the chlorination of benzenes, one can anticipate the presence of PCB when DCB is detected. Historically, PCB has been used in the manufacture of fungicides, and, more recently, as a flame retardant. This could indicate past PCB contamination, which has been re-mobilised through environmental processes, and eventually entered and accumulated in the Grootdraai Dam. Domestic and industrial discharge could also be a source of chlorobenzenes. These compounds can be introduced into the Grootdraai Dam via return flows from wastewater treatment plants within the catchment. 1,4-DCB is used in common household products such as air fresheners, moth balls and urinal deodorisers. These chlorobenzene compounds are also common components of industrial degreasing solvents (McPherson et al., 2002). Negligent and poor waste disposal protocols at both domestic and industrial level can lead to contamination. The major industries in the Groot-draai catchment are are the Matia and Tutuka power stations and Sasol, Secunda. Table 2 indicates that both power stations have a zero-discharge policy; as a result, contamination is negligible. Sasol, as well as the Thutukane, Bethal and Ermelo Municipalities, are the main contributors to the return flow into the Grootdraai Sam. As a result, one cannot rule out these as possible sources of chlorobenzene contamination. The South African Drinking Water Standard (SANS) 241:2005 for drinking water does not regulate any of the detected chlo-robenzenes. The SANS 241:2005 is derived from the World Health Organisation (WHO) Guidelines for drinking water quality. The SANS 241:2005 standard indicates that, for the organic determinants which are not listed, one should refer to the WHO Guidelines for drinking water for comparative purposes (DWAF, 2005). The WHO has set a health-based guideline value of 300 ng/ml for 1,4-DCB (WHO, 2011). This indicates that the level of 1,4-DCB within the Grootdraai Dam (1.685 ng/ml) is well within the WHO guideline and does not pose a significant health risk. Since WHO has not derived a health-based guideline for the other two isomers detected in this study; a health risk assessment cannot be derived. The results show that the technique of immersing the SPME fibre coupled with analysis by GC-FID is viable for routine monitoring of dam water samples for the presence of chlorinated benzenes. Furthermore, it is adequate to detect the limits set for two of the three chlorobenzenes regulated by the USEPA and for one of the two chlorobenzenes listed by the WHO. Furthermore, the optimised DI-SPME method produced lower LODs than the HS-SDME. An added advantage of this method is that it is relatively cheap and easy to use. It should therefore be of service to organisations which monitor their drinking water, as well as source water, for levels of chlorobenzenes, in order to ensure public health protection and safety of its customers. Mr Jimmy Chetty is thanked for technical assistance and Eskom and DUT for financial support. Accepted in revised form 21 December 2012.